Saving money is always something that appeals to people, but when you’re trying to save on local things, most people usually turn to Groupon. This has been a standard service that people have bought into and can get great deals on pretty much anything. From dining out to entertainment, you can save tons of money through a local network of retailers and companies. Most people are aware of this already and don’t need to read another article about how great Groupon is. Facebook, on the other hand, has a services that not many people are aware of. It was late last year that Mark Zuckerberg, the founder and C.E.O. of Facebook, announced that Places would be a new location feature that would allow people to redeem deals or coupons at retailers and companies nearby. Places seems to be more popular for it’s ability to let your friends know where you’re at. By Checking-in, you make people aware of what you’re doing and it allows you to remain social even when you’re not on Facebook. Users would do this through their smart phone or app supporting Prepaid Phone. Places is a mobile application that was originally designed to allow retailers and other merchants to offer deals and coupons through the application. This new feature greatly intensified the competition in the current market for mobile advertising. Zuckerberg stated, “We’re enabling merchants to push deals out to their existing customers and hopefully attract new customers.” When someone uses the Places feature, a yellow icon pops up on your phone that informs the user that they can use a redeemable coupon at a nearby business. Now that Places has been around for a while, there’s a new feature to the application called Deals. It’s all about getting social networks involved in deals and local stores. The function gives businesses the ability to offer bargains and discounts through the Places feature. This is a win-win situation for businesses and customers. It’s giving companies increased exposure far beyond that of a fan page. It’s real networking and adverting that only costs the the price of the coupon that’s being redeemed. This way, you can see immediate impact with your marketing dollars. These new features come at an important time as the Google Plus has begun to challenge Facebook’s social network supremacy. Facebook will have to look for increasingly newer ways to stay relevant to the vast public. 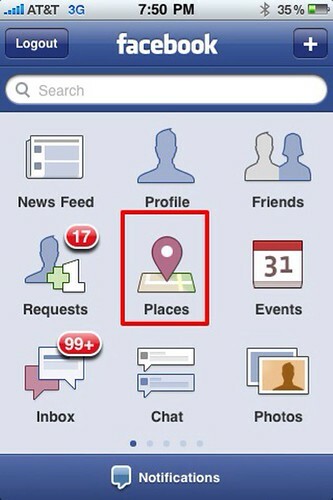 It’s base is already made up of 500 million users but, as we’ve seen with MySpace, that can change very quickly. Places, and the additional Deals feature, are a great way to attract local attention throughout the world. Check it out if you want to save some money while out on the town. This isn’t the only application that gives you great deals but it’s definitely a good one to look into. This article is by Ryan Sandberg who is a freelance writer with a passion for entrepreneurship, efficiency and ice hockey. He enjoys sharing his opinions/findings on finance, marketing, entrepreneurship and current tech trends. we used a new Places coupon just last weekend at a festival. the booth staff handed out fliers at opening time to promote the coupon. it worked pretty darn well! we’d never eaten from that booth and it was enough to get us to try it. That’s awesome. I’ll have to keep that in mind while shopping. Thanks for sharing that! Previous post: When Are You Retiring?